Well its official now, we have received our licence as issued by the PSA – Private Security Authority. This is now your guarantee that An Garda Siochana has vetted us. Our workmanship has been tested and verified as having reached the required standard for the installation of intruder alarm systems. 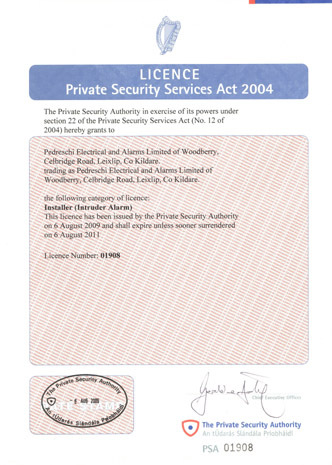 The Chief Executive Officer of the PSA, Geraldine Larkin, has issued our licence. Not only has our quality of workmanship been tested and checked but our document and record keeping has been checked and confirmed as reaching the standard as set down in EN50131 and SR40. This is to enable you the client to have quotations received in writing and to be able to compare like with like, to cut out the jargon and give specifications in plain English. This is an ideal time to have your alarm system installed or indeed serviced before the dark evenings are upon us. We all rely on our alarm systems every day and night and it is only when it is broken that we are put in a vulnerable position. So now is a good time to have it checked and serviced.